"What's good for breakfast around here?" "You have to go to Rise. It's our favorite place." 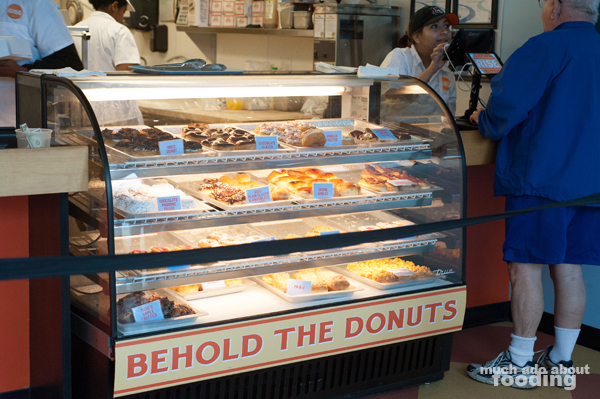 Once you walk through that door, you are immediately immersed in the tempting smells of fried dough and baked buttery goodness. 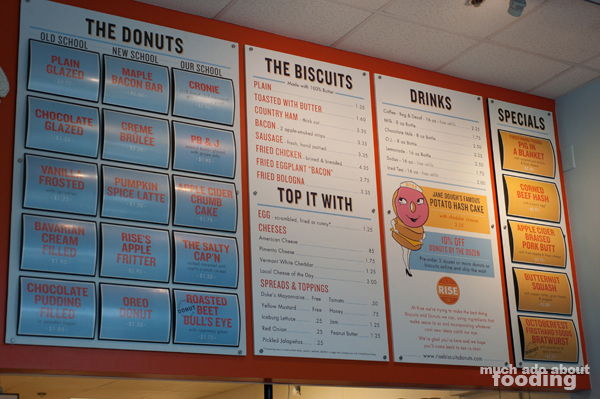 The bright, welcoming colors partnered with an easy-to-read menu (and an extremely flirtatious display case of fresh donuts) wrap up a good first impression before the second impression floors you - such cheery, good customer service! The decision to go with biscuits for us that morning only came to head because our friends brought us their donuts the day before. 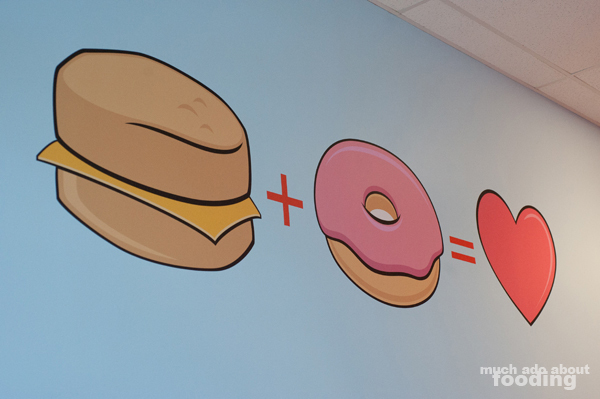 By the way, get some donuts. They do classics like glazed and jelly-filled but also some newer styles (maple bacon bar, creme brulee filled <-- astonishingly good, etc) and their own spins (PB&J, yum). It can't hurt to bring some home with you. 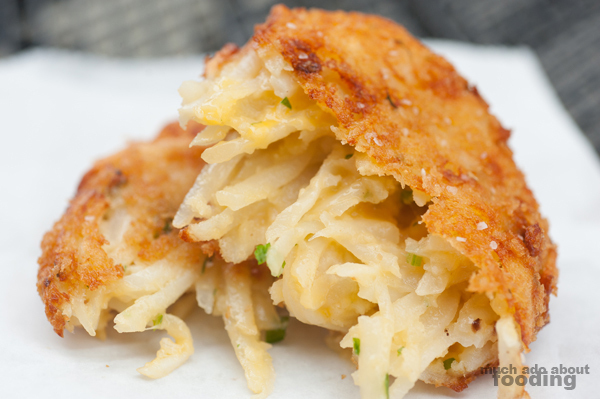 I personally just had to grab myself their Jane Dough's Famous Potato Hash Cake ($2.25 - with Cheddar cheese) because I am a sucker for hash browns. The disc of deep-fried goodness did not disappoint. Oozing with cheese and chopped chives while being perfectly salted and browned, the hash cake was the perfect start to breakfast and an order I wouldn't mind have six of...though I'm sure the waistline would mind. 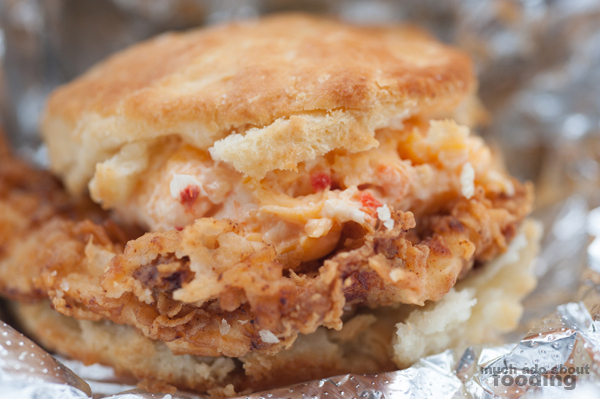 Duc turned to one of their mainstay biscuit options - the Fried Chicken ($4.35 - brined and breaded) with the addition of Pimento Cheese ($1.75) atop. 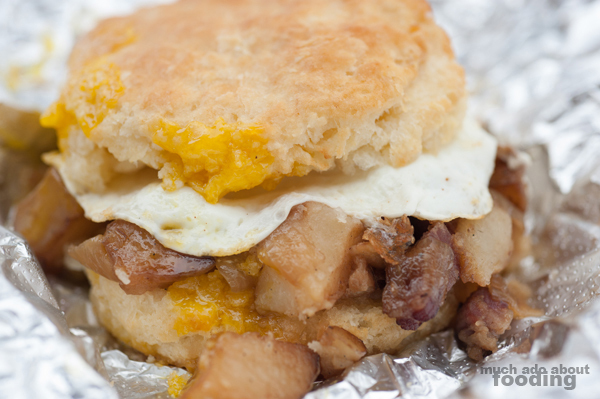 With all the biscuits, you can top them with differently cooked eggs, various cheeses, and other spreads at an additional cost. Since pimento cheese is so staple to Southern food, I encouraged him to smother the fried chicken with it and what a good decision. 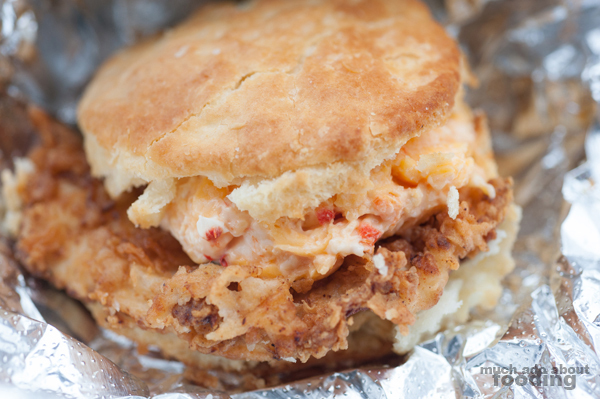 The chicken was beautifully fried and moist inside, caressed by the savory pimento cheese and hugged on both sides by fantastically buttery biscuits both fluffy and rich. I aimed for one of their monthly specials, the Corned Beef Hash ($5.75 - with runny egg) just to make a mess of myself. The oozing egg certainly made it a well-rounded breakfast experience but also gave me more to sop up with the biscuit ends. We particularly enjoyed the generous amount of corned beef and potato cubes as well here. Overall, what a great spot for some delectable morning tummy-lovin'!